American House Spiders are typically a dull brown color, with the appearance of spots on their bodies and legs. American House Spiders are the most commonly encountered spider by humans. 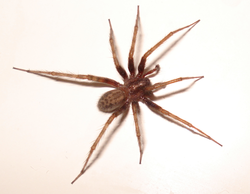 If you see a spider in your house, it's likely an American House spider! They will build multiple webs until they find a spot that is most beneficial for them, so they are responsible for a lot of cobwebs. American House Spiders build webs in corners and behind doors, and prey on common household insects and pests. Since they frequently live so closely to humans, they are rarely aggressive and their bite is not seen as dangerous. Click here to learn more about Arrow-Shaped Micrathena Spider!